Jay (Kodi Smit-McPhee) is a young Scot who has travelled to America to reunite with his true love Rose (Caren Pistorius). On his journey across to the west he encounters a gunslinger named Silas Selleck (Michael Fassbender). They travel together, having a series of unusual encounters, and with secrets slowly revealed about their respective pasts. 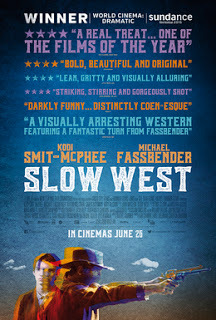 Slow West is a wonderful oddity. It is a New Zealand-British co-production, but it is also a western set in 19th century America. It is also an unexpectedly idiosyncratic and bleak comedy, albeit one that can unexpectedly burst forth with frank and bloody moments of violence. At the same time it is soaked in a sort of mournful, melancholic fog. The film marks the feature film directorial debut of Scottish director John McLean. Quite how a Scottish fine arts graduate came to shoot a western in New Zealand is beyond me. However he managed it, I am glad that he did. Smit-McPhee makes for a wonderfully credulous and slightly unearthly lead. Jay is an earnest young man to the point of active gullibility. His love for Ross appears to be pure and absolute, and a series of flashbacks reveal both the childlike romance he found in her and the tragic circumstances that led him to the United States. He is a wonderful pacifist protagonist in a brutally hostile environment. As Silas, Fassbender gets to play a stock stereotype gunslinging cowboy: a bounter hunter with few words and a cool head. We the audience know something Jay does not. Silas is using him to get to Rose, who – along with her father (Rory McCann) – has a $2,000 bounty on her head. Of course events of the film give rise to some growing ambivalence. Silas develops more depth as the story goes on, and by the climax it is unclear precisely what he is planning to do when he finally finds Rose and her father. Along the road there is an episodic series of well-written and performed encounters, including a group of African singers, a lonely German out in the prairie, immigrant armed robbers and a gang of bounty hunters led by Silas’ former partner Payne – played with a wonderfully scabrous charisma by Ben Mendelsohn. These sorts of episodic road movies can easily turn tedious, but McLean cleverly cuts his film to the bone, allowing to run a mean 84 minutes and never reaching a stage where the audience is bored. On top of all of that there is also the film’s oddly fairy tale-like, lyrical tone. There is an oddly fantastical quality about the film that sometimes feels less like a film and more like a dream. It is accentuated by an oddly idiosyncratic musical score by the Mess Hall’s Jed Kurzel. It is an exaggerated score almost to the point of being twee, but it is one that unexpectedly fits the film perfectly. Odd, beautiful and unsettling, Slow West is a remarkable pleasant surprise – and one of the most original westerns to come along in many years. This review was first published at The Angriest on 7 April 2016.